You’d like the same look and feel of the calendar on your mobile device as on the desktop. You are most comfortable with using Teamup in ways that are consistent on both mobile and desktop. You’d like to use some of the Teamup features that are not available yet in the Teamup mobile app, such as customizable event fields. 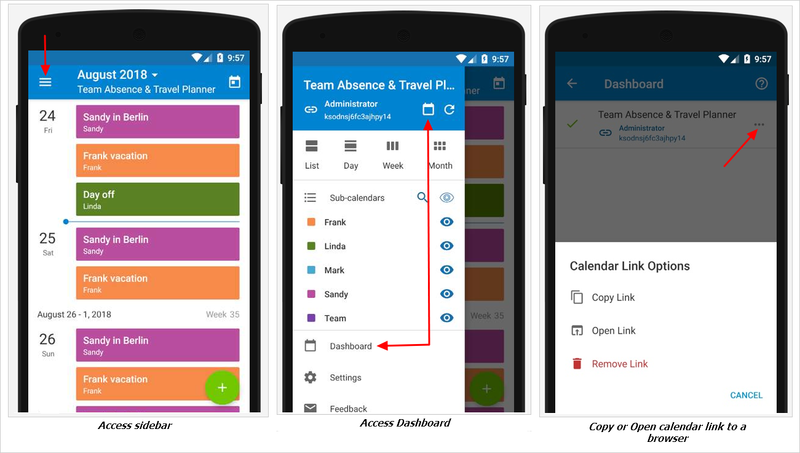 You’ve received a Teamup calendar link but would prefer not to set it up in your mobile app. You’d like to change some of your calendar settings, add a sub-calendar, or create a calendar link. These can all be done in Settings (by the calendar administrator) in a mobile browser. You’d like to save an event to the default calendar application on your device, e.g. Google Calendar. Regardless of the reason, here are a few tips for making your mobile web experience with Teamup smoother and more productive. Note: this article discusses accessing Teamup on a mobile browser when using an Android device. For instructions for using Teamup on a mobile browser with iOS devices, see this article. Use a calendar link that has been sent to you and is accessible on your device. This could be a link in an email or a text messaging app on your device. Tap on that calendar URL and select your mobile browser as the method for opening it. From your Android app, access the sidebar and go to the Dashboard. Click the 3 dots next to the calendar link. and select Copy Link or Open link. If you copy the link, you can then paste it into your mobile browser’s address bar. If you select Open link, you may be prompted to choose how to open the link: via the Teamup app, or via a mobile browser. Select the mobile browser option when prompted. Type the calendar URL directly into the address bar of your mobile browser (which could be Chrome, Firefox, Safari, Opera, or Microsoft Edge browser). In a mobile browser, you can interact with your Teamup Calendar as you would on a laptop or desktop computer. The smaller screen size of a mobile device can make calendar use a bit different. Experiment a bit to find the best way to view your calendar on the small screen. Day, List, Agenda, and Scheduler view tend to work well on smaller screens. You can create and modify events, access Settings, and use features such as Signups, Event Comments, and File Uploading when using a mobile browser. Make use of the Sharing options that allow you to save the event to your personal calendar or to share further via social media apps, email, or as a web page. Once you open a calendar link in your mobile browser, you can add it to the Home Screen of your Android device for quick access in the future. Tap the menu button (lines or dots) and tap Add to Home Screen. After creating the shortcut, tap the Teamup icon (see the above screenshots) to access your calendar. You can add multiple calendar links to the home screen, resulting in multiple Teamup icons. You can give the icons different names to differentiate between calendar links. Your Teamup calendar icons can be placed side by side on your home screen or organized in a Teamup folder, if you prefer. Note: the home screen icons are the Teamup logo with a white border, whereas the Teamup app icon has a green border. 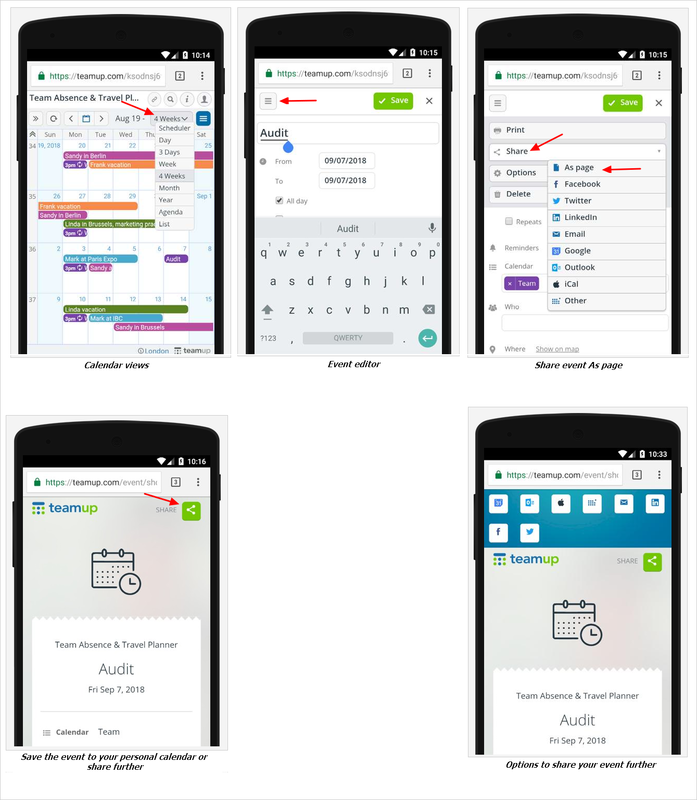 You can alternate between viewing your calendar in the Teamup mobile app, or in a browser on your device. It’s up to you and your needs.